Boomile LED TV Backlight, USB LED Strip Lights 6.56ft 2M 5050 RGB Light Strips Kit Bias Lighting with Remote Control for HDTV, Flat Screen TV Accessories Desktop Monitors PC, Multi Color by Boomile at Two Clock. MPN: unknown. Hurry! Limited time offer. Offer valid only while supplies last. 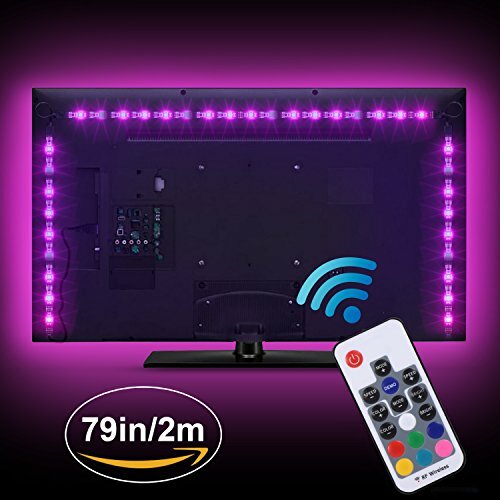 Light Up the Dark Corners☀ Boomile LED TV Backlight Kit includes 4 detachable strip lights, 3 light strip connectors and 24-key remote controller. furniture. 5V 5050 RGB LED light features low heat and low power consumption. Remove the dust from the surface before stick the strip light for better viscidity. The strip lights must be connected with corresponding polarity. Use the alcohol to remove the residual 3M adhesive tape. 12 months warranty. Any quality problem for product, please do not hesitate to contact us. LED TV Backlight Strips: Come with 4 light strips, 3 light strip connectors, 24-key remote controller and a LED controller with USB interface. Relieve Your Eye Strain: Adds a subtle backlight your monitor, TV, desktop, PC, reducing the eyestrain caused by differences in picture brightness from scene to scene in movies, shows and games. It can also help make the grays and blacks on your screen seem richer. Easy Installation: Use the firm 3m adhesive to attach to almost any surface, provides secure and strong installation without worrying about falling off, flexible strips bend to your desired positions. Wide Application: Boomile USB led strip is perfect for lighting and decoration solution for TV, computer, cabinet, bookshelf, closet, corner, holidays, Christmas decoration etc. If you have any questions about this product by Boomile, contact us by completing and submitting the form below. If you are looking for a specif part number, please include it with your message.